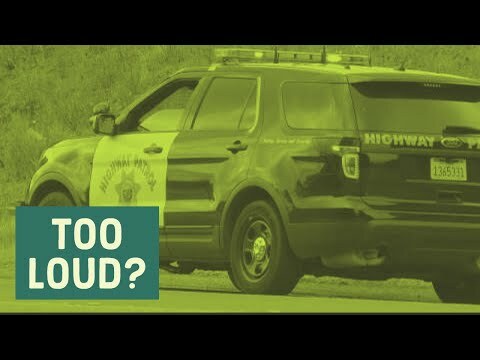 The CHP (California Highway Patrol for those outside of California) has posted on social media that they will be enforcing the new law. Some of the drive for this has been some reckless activity by people taking over streets and doing things like donuts. People have been injured and even killed because of this recklessness. Of course cracking down on loud exhausts does not prevent dangerous driving. The muffler also has nothing to do with reducing emissions, so this is pretty much all about sound. The bill and related vehicle code changes target enthusiasts that would like a slightly louder exhaust and it allows the officer to make the judgement on the exhaust. It gives them probable cause for pulling over anyone with what they think is an aftermarket exhaust. This is a judgement law and apparently someone with a stock BMW M4 has already been given a ticket for their stock exhaust system. This could easily happen to someone with a performance car. Cars like the Dodge Challenger SRT Hellcat, Porsche 911 GT3 and Subaru WRX all have stock exhaust setups that could easily be targeted as if they were aftermarket systems. Sure if you take it to court you should win, but think of all of the hassle and stress that wouldn’t be there if it was still just a fixit ticket. There are a number of things covered by the bill AB 1824. Below is the portion of the law pertaining to the change in the modified muffler law. This bill would include, among those conditions that are disqualifying, a violation of the above-described requirements related to mufflers and exhaust systems. We think that this law unfairly targets enthusiasts that drive performance or even slightly modified vehicles. California has a great car culture even though some folks in Sacramento have constantly tried to destroy it. So, what can we do to reverse the way this law is enforced? There are two things. There is a petition on Change.org about this and you can add your signature by clicking here. A peaceful protest is also in the works related to the petition. With politicians contacting their office works wonders. Calling or emailing your representative in the California Assembly, letting them know that if they do not do something to change the muffle section of AB 1824 that you will be voting against them in the next election will have a huge impact. The more Californias that do this the faster all of this will change. So that you know who to contact, below is a list of every member of the California Assembly that voted for AB 1824. To see if your local representative is on the list visit California’s representative finder. If your assembly member is one listed above, the finder will provide a link with information to contact them. If we band together we can get this unfair enforcement of a law that is more of an annoyance for some people changed. Make sure to share how we can change this with all the folks you know in the state of California (if you are outside of California, but have friends in the state let them know about all of this). The great thing about our system is we are given a voice and now is the time for automotive enthusiasts to use it or else face continued loosing of our freedom to drive our passion. Not one Republican. Hmmm. Liberalism at its finest. F California. Time to move. While Americans are free to worship their vehicles in shallow and immature fashions, they have NO RIGHT protected by law to force other Americans to worship them too. You can’t call yourself a patriotic American if you don’t respect the RIGHTS of other Americans to live in quiet safe communities. Loud pipes FORCE other Americans to live with them. And if no one cared…… I doubt laws would have been passed against loud pipes. Sorry folks….. this is America….. the majority rule here. Loud pipes are a choice not a necessity, question is why would any adult American male choose to disregard the rights of other Americans to begin with. Shouldn’t these people grow up? You make some good points, but there are a few issues. The first is that this wasn’t voted on by the people as an issue. It was put inside of a bill with many unrelated laws. If it had passed based on a vote of the people then that would be somewhat different. Second, the real issue is enforcement. There are multiple reported cases of stock exhaust systems being ticketed as too loud. There are also others that are not over the legal limit, but the driver is still getting pulled over and then being forced to go to court and go to a state referee to prove they aren’t over the limit. The police can give a ticket based on what they think without any scientific way of measuring the sound level. The big change about this law is the enforcement now makes it much more work to prove you shouldn’t have received a ticket in the first place. Now I personally don’t like exhaust that is too loud, but sometimes a little more than stock sounds good without being annoying.